How is physics instruction conducted? Saturday, April 28, 12:30 p.m. The Mars InSight Mission Roadshow is coming to the Cal Poly campus at 12:30 p.m. on Saturday, April 28, in the Chumash auditorium. The mission, led by NASA's Jet Propulsion Laboratory in Pasadena, Calif., will be the first to study the deep interior of the Red Planet. InSight stands for Interior Exploration using Seismic Investigations, Geodesy and Heat Transport. Information from the mission is expected to advance understanding of how all rocky planets, including Earth, formed and evolved. Featured speaker Troy Lee Hudson is a technologist at the NASA Jet Propulsion Laboratory (JPL). 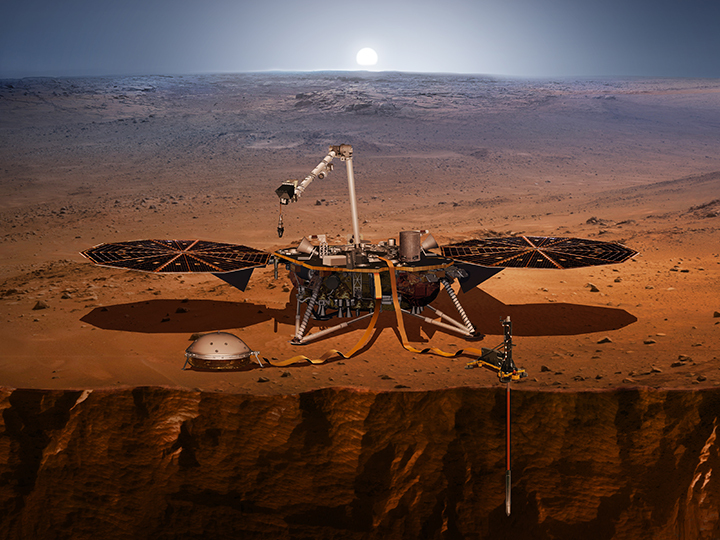 His presentation about the mission will explain how the InSight robotic lander will help scientists make comparisons between seismic activity on Earth and Mars. The rocket that will loft InSight beyond Earth will also launch a separate NASA technology experiment: two mini-spacecraft called Mars Cube One, or MarCO. These briefcase-sized communication CubeSats will fly on their own path to Mars behind InSight. Cal Poly engineering students assisted Tyvak Nano-Satellite Systems and JPL in the preparation and testing of of twin MarCO units. They are the first CubeSats to be used for an interplanetary purpose. In addition to the talk, an exhibit on the MarCO spacecraft will begin at 11:30. Visitors can talk with engineers from JPL and Tyvak as well as Cal Poly students involved in the project. For additional information about the event, call 805-756-2448. Learn more about NASA's journey to Mars.